There's no doubting the quality and variety of kicks Punch BD can deliver for those prepared to get involved, though. A wide-range of quality sounds. Lots of control available. Virtual instruments dedicated to the production of kick drums seem to be 'a thing' these days, with Vengeance's Metrum, Sonic Academy's Kick and Plugin Boutique's BigKick the key players. 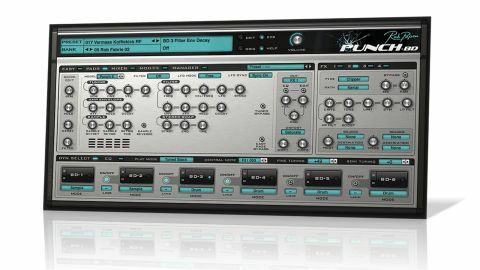 Essentially a repackaging of the kick modules from the superb Rob Papen Punch drum machine, new contender Punch BD is about as all-encompassing as a bass drum instrument could conceivably be. A Punch BD patch is built on six independently edited pads, which can be stacked (pitched or unpitched), assigned to separate notes, or triggered in cycling sequence (pitched or unpitched). "A very deep level of control is given over the parameters of each pad"
Every pad offers a choice of Drum (synth) or Sample mode. The former draws on a set of four varied synthesised models (with pitch and amp envelopes, plus optional Click/Noise and Punch parameters), as well as a library of sampled kicks. Sample mode lets you combine two samples - from the included library, which covers a wide range of drum, percussion and other sounds, or of your own choosing - by layering, mixing or alternating them. A very deep level of control is given over the parameters of each pad, with a small bank of Quick Edit knobs on hand for making fundamental changes in a hurry, and the Easy page giving global control of pitch, filter and mix levels. There are also hundreds of individual pad presets to use as starting points, alongside an abundance of full instrument presets. Punch BD isn't wanting in the processing department either, with distortion (19 types! ), parametric EQ and four effects slots (each accessing a menu of 31 excellent modules - filters, reverbs, delays, etc) onboard, as well as two envelopes, two LFOs and an eight-slot modulation matrix. Punch BD could be reasonably described as an over-complicated tool for what is a relatively straightforward task, particularly in comparison to its more focused rivals. Fortunately the sounds make it worth the hassle.